We just finished our basement - we had been in our house 7 years. It was time! My husband hired the trades we needed, and we did as much of it on our own as we could with the gifts we have. We basically did the electrical and painting. I guess we don't have that many gifts. 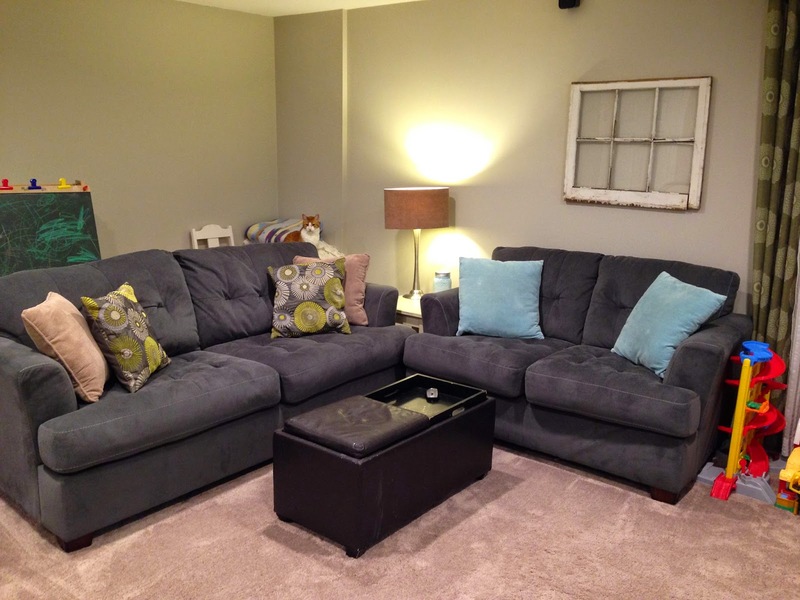 :) Here are some tips I have for decorating your basement on a budget. I'm not putting down interior designers - they rock at what they do, and I'm just a little jealous I wasn't one myself. But here's a secret: If you don't have oodles of money to spend on a decorator, you can actually learn tips, tricks and steal awesome ideas from Pinterest! It is a HUGE resource for everything you can think of. I got so many great ideas about arranging furniture, decorating, painting... you get the picture. One tip I love, is using old books stacked under objects to give them height and interest. 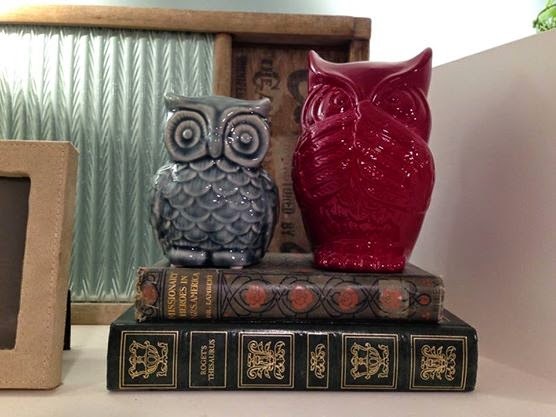 In this picture I purchased these ADORABLE owls from Walmart and stacked them on some vintage books I bought at our local thrift store for 25 cents each. 2. Kijiji, Buy and Sell sites, Thrift stores... Are the best! I'm always on these types of sites, especially when I know I need new furniture, appliances, winter clothes for my kids, anything that is perfectly good in used condition. Why buy new if you don't have to? Buying second hand is more economical and it's better for the environment. I knew I needed new couches for our basement (the 70s duo we inherited from my mother-in-law were not going to cut it for me). So for about three or four months, I looked tirelessly on various sites trying to find a good, clean, second-hand pair of couches. Let me tell you, patience was key! But alas, I waited for the perfect moment and then my couches appeared. They were $600 for the set but they were brand new. They had been used to stage a show home so they hadn't even been sat on. I was so excited! We barely got the couch down the stairs, and my cousin nearly broke his neck falling down the stairs as we brought it down, but they worked out so great. The cushions are from Walmart and some shams are from Ikea (covering old pillows). The old picture frame window was from Kijiji for $3! The lamp was from our local thrift store for $5. 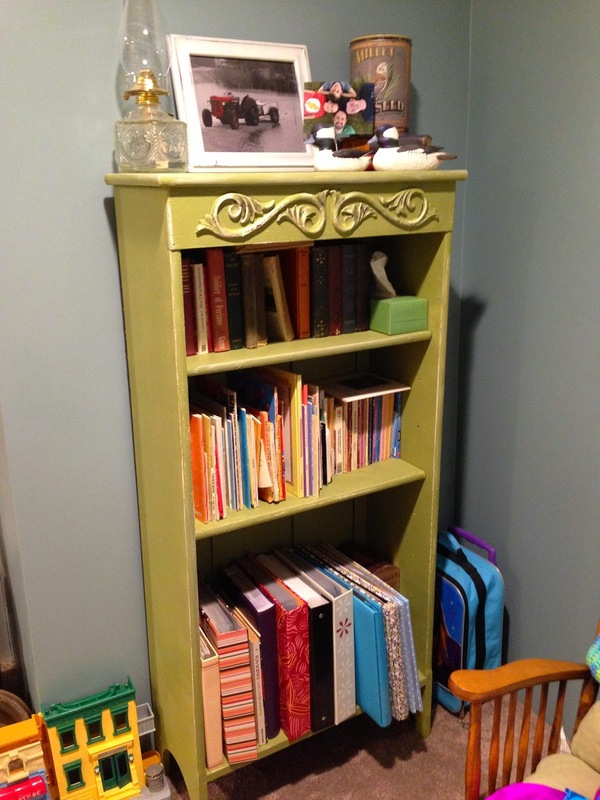 I have repainted a lot of furniture in the last few years. 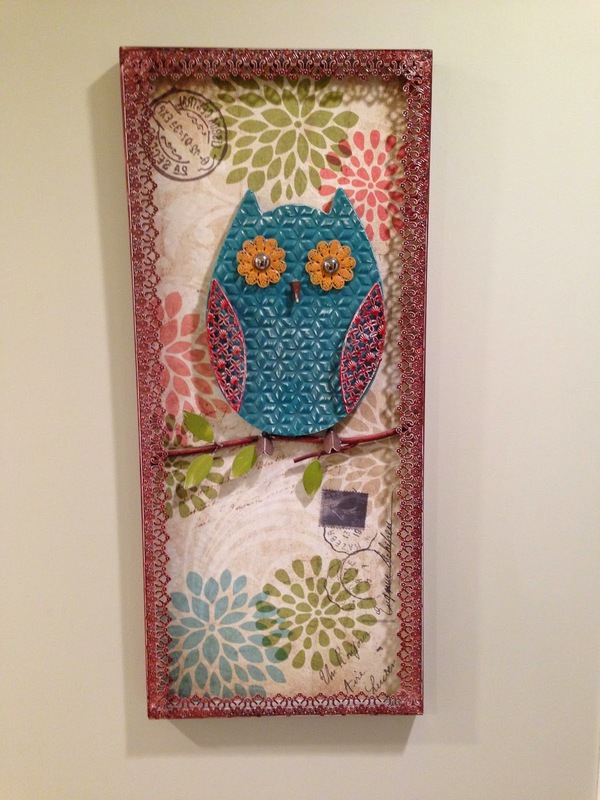 I buy older pieces from thrift shops or Kijiji, then I paint and distress them to get that shabby chic look that I love. The shelf was purchased on our local Buy and Sell Facebook page for $35. I repainted it using Plaster Paint from a local store here called Real Deals on Home Decor. 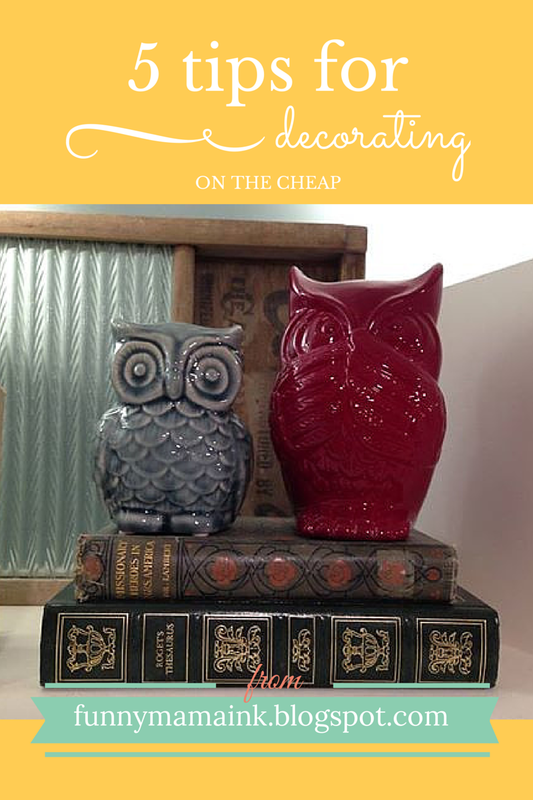 A great place for shabby chic looks at a fraction of the price. It's my favourite home decor store! My end table was purchased at a garage sale for $5. I repainted it as well. Another tip: we just bought a paint sprayer. A bit of an investment ($125) but it speeds up the painting process SOOOOO much. It took me ten minutes to paint the end table. 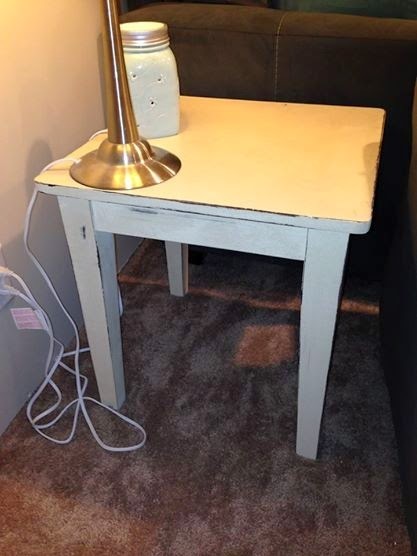 That table was done with Annie Sloan Chalk Paint. It's a bit more pricey than Plaster Paint but it goes on a little nicer in my opinion. I didn't buy a lot of new items for our basement renos but I did buy a few key items that didn't cost lots but had a big impact on the look of our house. I love these picture rails from Ikea for $14 each. 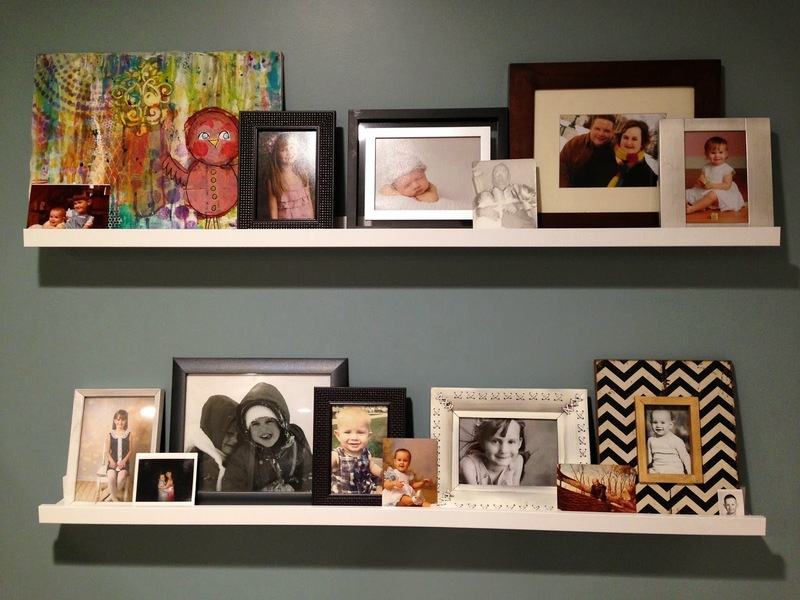 We created a little gallery wall with pictures and art work. Most of the frames I purchased second hand and painted. My curtains are from Giant Tiger. I bought them for $10/panel. By using long curtains on a small basement window, it tricks the eye into thinking you are on a main level. Sneaky! As I mentioned earlier, I love our Real Deals on Home Decor store in Winnipeg. It's got such cute furniture and decor at a pretty decent price. I purchased a few wall hangings from there. Can't remember the price exactly for the owl but I think it was about $30 or so. 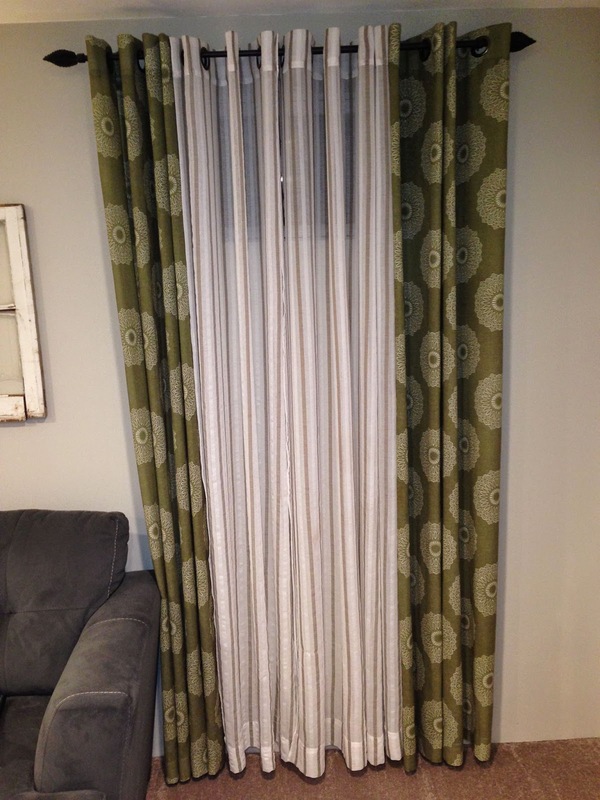 Also notice the green in the curtains, pillows and curtains - they all have the same circular patterns. Total fluke! I know we all want it now, want it fast, want it done. But I promise you, if you give yourself a few minutes a day to check out websites like Kijiji, you will find amazing deals for fractions of what you would pay for new items. Like I said, it took about 4 months to find the perfect second-hand couches, but I found them. A great money saving tip too - I would only buy things for our basement with money I had earned by selling things we didn't use anymore. Out with the old, in with the slightly not as old but new to us! Save, plan and hunt. That's how you win this game! I'd love to see some of your best thrifty finds or hear some of your tips. 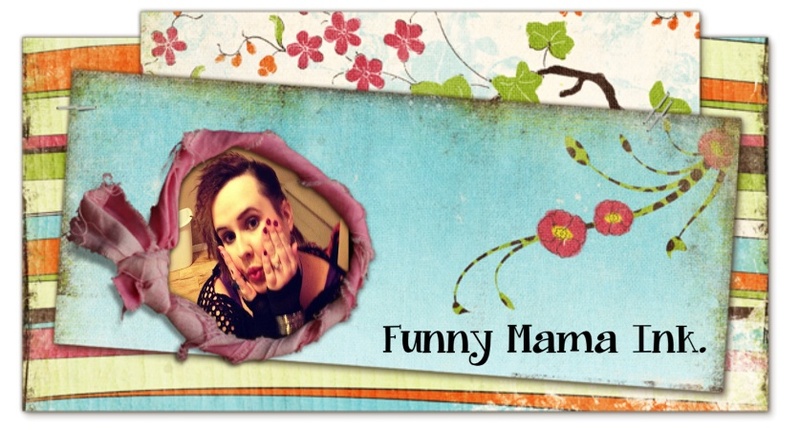 Please share them in my comments and share this post with your frugal friends!